BRATTLEBORO -- Once Carol Bellamy announced she'd be taking the reins at World Learning, graduates of the school started coming out of the woodwork. Bellamy's job at the time, head of the United Nations Children's Fund, meant she knew people all over the world. But it wasn't until she was named to the top post at World Learning earlier this year that a number of work colleagues told her they'd attended the School for International Training. Now, as she leaves UNICEF, Bellamy is acquainting herself with World Learning and a new chapter in her life. "I'm not retiring yet," she said Thursday. "I'm looking forward to this." Bellamy is moving to Brattleboro next Wednesday to fill the slot of president and chief executive officer of World Learning and president of its School for International Training. She was on campus Thursday and was interviewed by the Reformer in the office that awaits her. The post is a change from her usual surroundings; she's always worked in metropolitan areas. She visited Iraq in 2003 when the insurgency was beginning and this year she went to Sri Lanka in the aftermath of the massive tsunami. "It's fascinating," she said of her old job. "It's not just running around kissing babies." She said AIDS is the biggest threat to children worldwide, especially in Third World countries. She said Americans have trouble grasping what other countries are going through because most do not see the suffering first-hand. Bellamy will officially take the World Learning helm next month, but she'll be sitting in meetings before that and moving into her rented home in town. 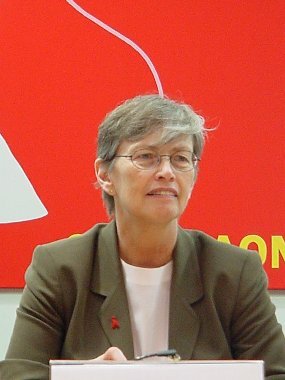 She succeeds James A. Cramer, who stepped down in December 2004 after six years as the head of World Learning. World Learning, which was founded in Brattleboro 72 years ago, has four programs: The School for International Training, The Experiment in World Learning for International Development, World Learning for Business and World Learning for International Development. Bellamy said it's not her charge to change the institution, but to help it evolve in a changing environment. She's hesitant to list specific goals at this point and wants to get more situated on campus first. Bellamy was named president in January at a time when her organization was busy helping tsunami victims in Asia. She rounded out 10 years as head of UNICEF, during which time she doubled the budget and strengthened its response capacity. 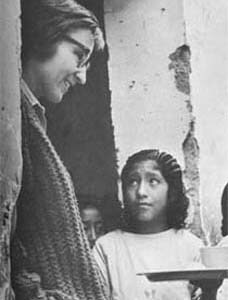 Before she joined UNICEF, Bellamy was director of the United States Peace Corps. She volunteered for the Peace Corps from 1963 to 1965 in Guatemala and became the first volunteer to end up running the organization. She's worked in corporate law and finance and spent 13 years as a politician, including a four-year stint as a New York state senator. In 1978, she became the first woman to be picked president of the New York City Council, a position she held from 1978 to 1985. After her many career changes, Bellamy still says working with the Peace Corps was the most important thing she's done in her life. "It opens your eyes," she said. "It stretches you. It changes you." Bellamy grew up in the New York City area and has just sold her Brooklyn apartment. She said she'll visit the city occasionally -- it's home to her -- but she's ready for a change. She sought a home in Brattleboro that would place her near downtown. "I'm looking for some tall buildings, but it's beautiful," she said, looking at the Green Mountains outside her office window. On the Net: www.worldlearning.org and www.sit.edu .